Add names & numbers to your jerseys for a professional look. 1) We will only personalize uniforms that we supply. 2) We recommend ordering a couple of extra jerseys as spares. 3) Contact our staff and we'll make the process easy. Just need basic numbers on your jerseys? We recommend using our 10" inch tall stock numbers. Choose from Black, White, Red, Royal Blue, or Navy Blue. 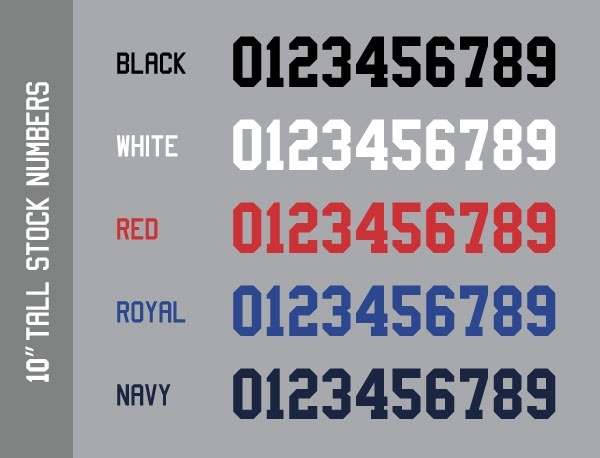 Vinyl numbers can be printed with different fonts and sizes. Limited to sans serif fonts. Choose from Black, White, Red, Royal Blue, Navy Blue or Golden Yellow. Names are always done in vinyl. They can be printed with different fonts and sizes. Use our standard sports font or send us your font file (Limited to sans serif fonts).